I was flying at 6000 feet en route to Prince William Sound, heading up the valley of Twentymile River toward a pass above the remote Carmen Lake. As I approached, I looked down and saw something I had never seen before. 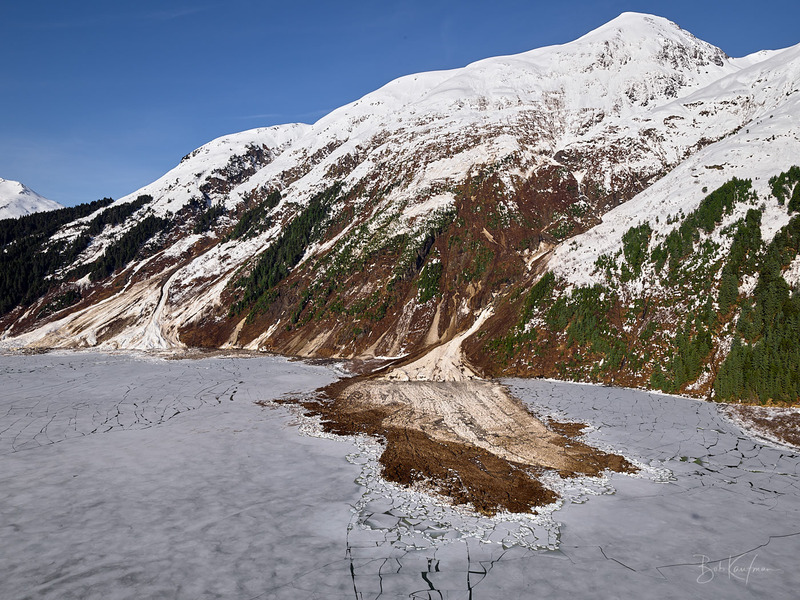 A colossal pile of dirt, rock, snow and ice had avalanched off the adjacent mountain face and spread over the frozen surface of the lake. It seemed as though it contained enough debris to fill a stadium. Spring avalanches are common in Alaska, when the heat and intensity of the afternoon sun saturates and destabilizes the snowpack. Lubricated by meltwater, great slabs yield to gravity and begin to move. They will often slide en masse, taking everything down to bedrock, entraining substantial hunks of the mountain as they descend. Often these can be the biggest avalanches of the year, sometimes carving brand new paths down the slopes and across valley floors. 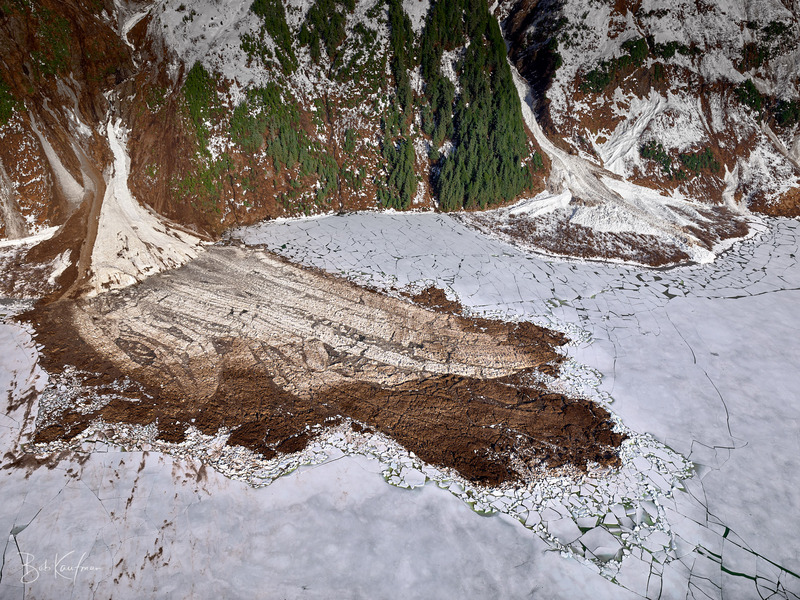 But this avalanche had exploded onto a still-frozen lake, and the result was unexpected. 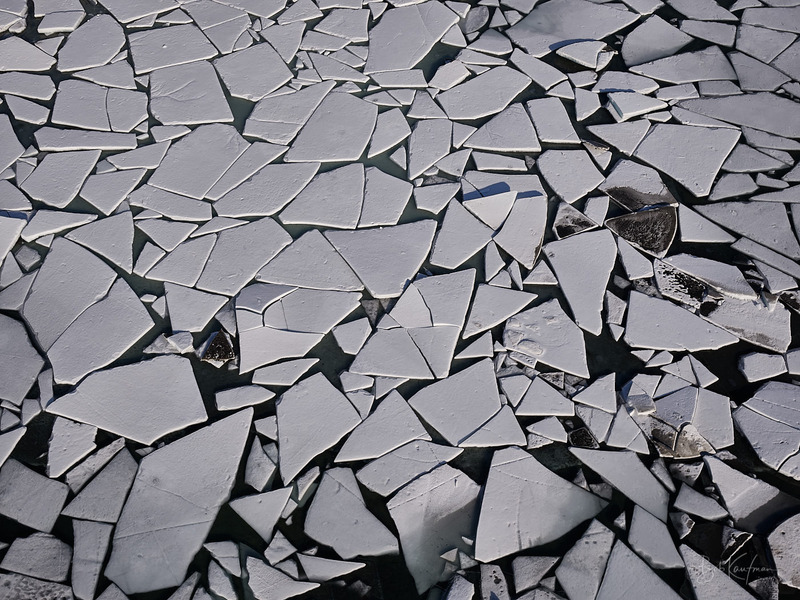 The ice had shattered into fractal patterns, as though nature’s hand had used a vegetable chopper to slice and dice the surface into polygons of every configuration. I was determined to photograph the scene, but I was also flying solo. 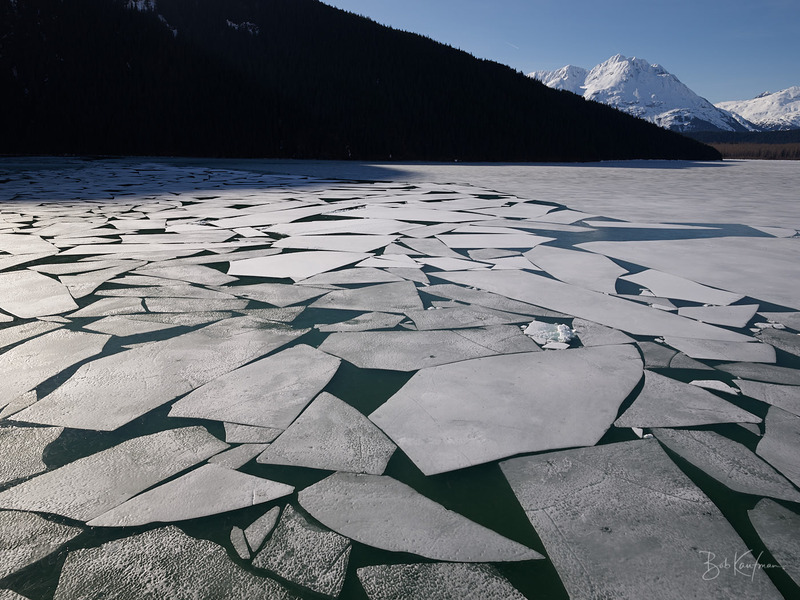 Realizing that the surface of the lake could melt out within days, and I would never again see the debris on the surface or the geometrically ruptured ice, I turned around and flew to the airport in Girdwood, about ten miles up Turnagain Arm. I picked up a co-pilot and returned before the sun set. Camera in hand. 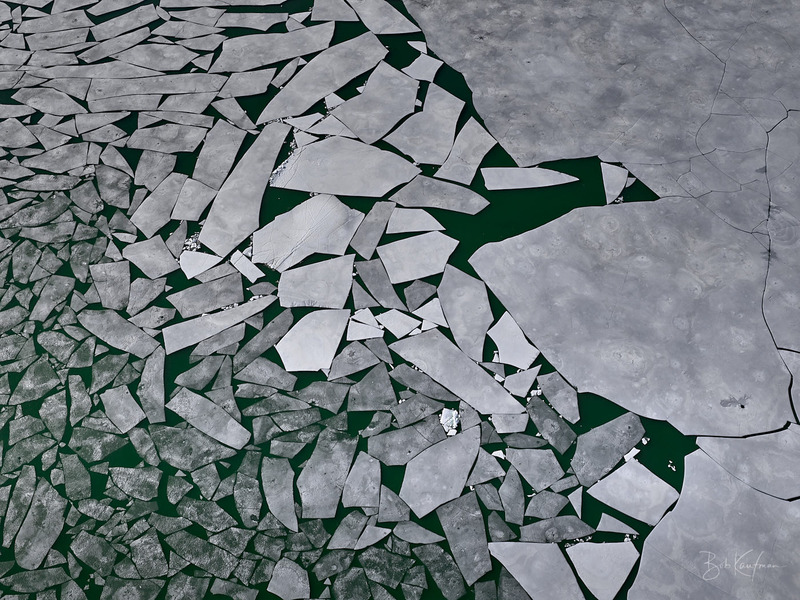 We flew within feet of the ice, and I began taking pictures. 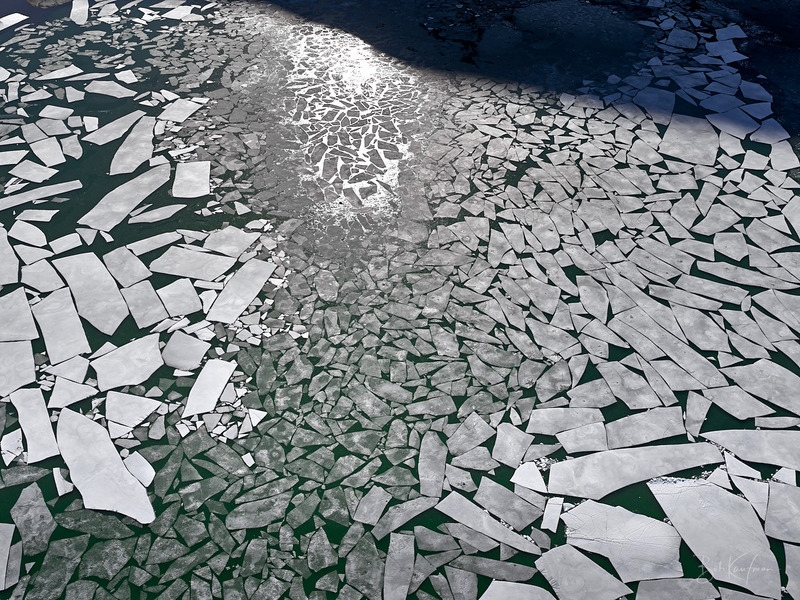 Fortunately, the surface of the water between the fractal shapes had slightly re-frozen in a blue-green sheen. That meant the rotor wash did not disturb the calm of the surface. The shards had congealed in this thin layer of ice and were not moving. There were so many shapes and possible combinations. Rectangles, pizza pie slices, trapezoids, rhombuses. The challenge was to find the right composition while hanging out the door of a hovering helicopter far enough to keep the skids out of the shot. There was no other way to capture a scene like this than from the air. At that moment in the season, with breakup well underway and snow rotting out, Carmen Lake was essentially inaccessible by overland travel. 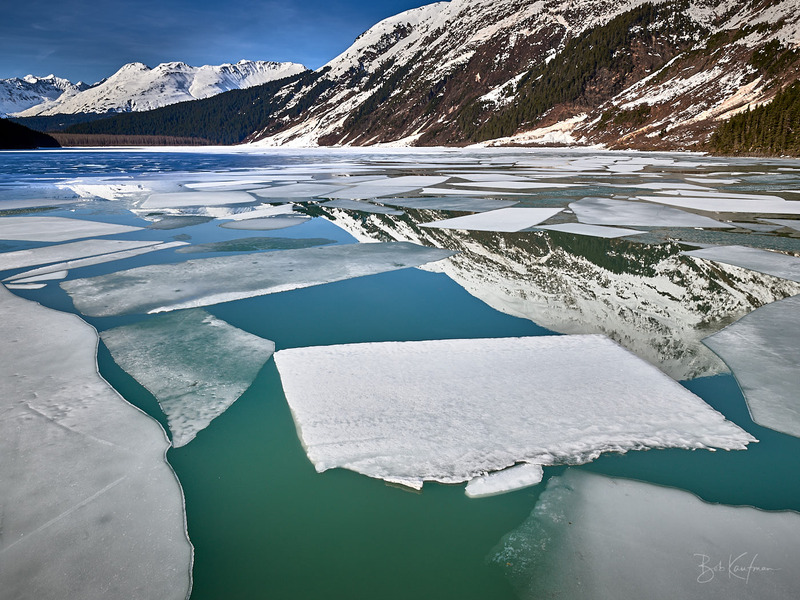 You could not navigate up the river to the lake, and even if you could have, you would not have been able to push a raft or boat through the ice congesting the shore. You could not walk, ski or ride a snowmobile into the area. 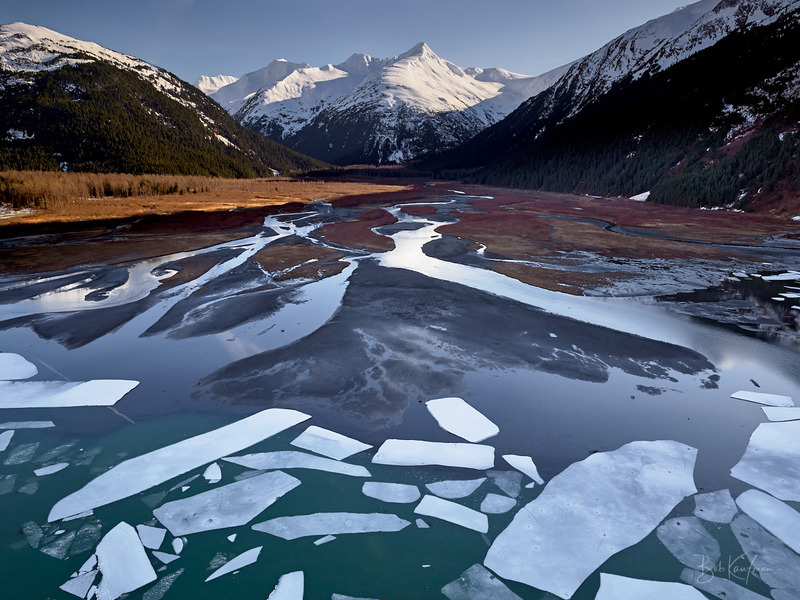 It was a remarkable scene, deep in the backcountry, that would have gone unseen were it not for the miracle of flight and being able to hover right above the ice.